PORTLAND, Maine - The commissioner of Maine's Marine Resources Department says next year the state won't participate in a research program that allows fishermen to catch some Northern shrimp. Interstate regulators extended a moratorium on New England shrimp fishing for another year on Wednesday. They fishery has been shut since 2013. But regulators did approve a "research set-aside'' program that allows fishermen to catch about 30,000 pounds of shrimp this coming winter. Some money from the sales of shrimp supports scientific research. PORTLAND, Maine - A decision is due about whether New England's long-shuttered shrimp fishery can reopen, but it looks like an extended shutdown is looming. New England shrimp fishing is based in Maine and has been shut down since 2013. An arm of the regulatory Atlantic States Marine Fisheries Commission is meeting on Wednesday in Portland to decide if there will be a fishery this coming season. PORTLAND, Maine - Fishing regulators will decide in November whether it's time to reopen Maine's shuttered shrimp fishery. PORTLAND, Maine - New England's long-shuttered shrimp fishery will likely have new rules designed to protect the vulnerable population of the critters if it reopens. The fishery, formerly based mostly in Maine, has been shut down since 2013 because the shrimps' reproduction has fallen in the warming Gulf of Maine. But an arm of the regulatory Atlantic States Marine Fisheries Commission has set new rules for the fishery, which could open as soon as this winter. PORTLAND, Maine - Interstate fishing regulators are getting ready to vote on whether to send a plan about the future of the imperiled Maine shrimp fishery to the public. 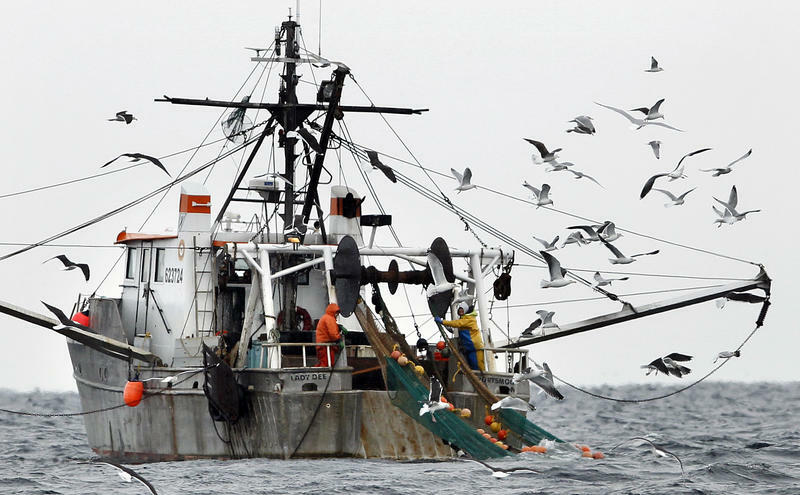 Regulators shut down the fishery in 2013 amid declining populations of shrimp, and say environmental conditions off New England are poor for the recovery of the stock. Scientists say warming ocean temperature is one factor holding them back. PORTLAND, Maine - Three New England states say they have tapped fishermen to collect samples of a species of shrimp that was the source of a lucrative fishery before it started disappearing. PORTLAND, Maine - Fishing regulators are looking to hire Maine fishermen to help study New England's imperiled cold water shrimp population. The interstate Atlantic States Marine Fisheries Commission and the Maine Department of Marine Resources say they plan to hire five shrimp trapping vessels to collect samples of Northern shrimp. The fishermen will also be allowed to bring 500 pounds of shrimp per week to shore and sell them. The project will begin on Jan. 30, 2017, and last for eight consecutive weeks. PORTLAND, Maine - New England's shuttered shrimp fishery will not be allowed to reopen this winter. An arm of the regulatory Atlantic States Marine Fisheries Commission decided on Thursday that it will keep the fishery closed because of concerns about poor reproduction in a warming ocean. The fishery has been shut down since 2013. It was mostly based in Maine when it was open, though some fishermen brought the shrimp ashore in New Hampshire and Massachusetts. PORTLAND, Maine - As the commission that regulates Atlantic fisheries is due to vote on whether to keep the shrimp fishery open for another year because of population concerns, a research project at the Gulf of Maine Research Institute is looking to get some real numbers about those populations. PORTLAND, Maine - A scientific committee says Maine's shuttered cold water shrimp fishery should stay shut down for at least another year. The shrimp fishery has been shuttered since the end of 2013 because of low populations. Scientists say warming ocean temperatures off New England are inhospitable for the shrimp. PORTLAND, Maine (AP) _ The deadline is approaching for northern shrimp trawlers and trappers who want to capture some shrimp as part of a government sampling program this winter. PORTLAND, Maine — A small amount of Maine shrimp will be available to consumers this winter despite fishing managers' decision to keep the fishery shuttered. An interstate regulatory board is closing the fishery for 2016 due to concerns about population loss and warming oceans. It has been closed since 2013. PORTLAND, Maine - A key panel says Maine shrimp are still depleted and fishing regulators' moratorium on fishing for them should remain in effect in 2016. Fishermen haven't been able to catch the shrimp since 2013. They were previously sought by commercial fishermen from Maine, New Hampshire and Massachusetts and were a popular winter item at fish markets. PORTSMOUTH, New Hampshire - Interstate fishing regulators say they will meet next month to decide if there will be a fishing season for Maine shrimp next year, though they say prospects are bleak. The fishery is currently shut down over concerns about its low population. Fishermen haven't been able to catch the popular food species since 2013. A panel of the Atlantic States Marine Fisheries Commission will make a decision about the coming season on Dec. 7 in Portsmouth. PORTLAND, Maine - A multi-state regulatory commission is asking the public what it can do to manage the depleted Maine shrimp fishery. The little pink shrimp have been largely unavailable to consumers since regulators shut the fishery down in 2013. The Atlantic States Marine Fisheries Commission is collecting comments from the public until April 15 about how to manage the shrimp fishery until. Regulators will soon have to decide if there will be a fishing season for the shrimp in the winter of 2015-16.